Keep stuff extra secure in an anti-theft bag developed in collaboration with the designers of LocTote. Built to thwart grabbing hands. 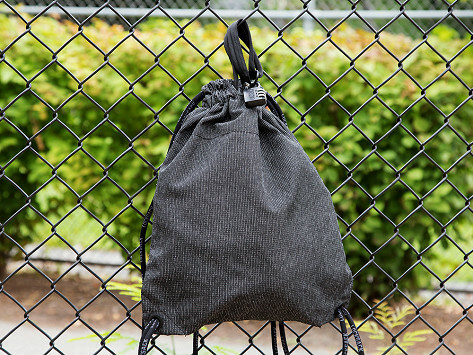 It looks like a drawstring backpack, but it’s like a stealthy, portable safe with locking straps with 1,000-pound breaking strength and an integrated metal combination lock. Locking strap breaking strength of 1,000 lbs. Dimensions: 17.5" x 13.5" x 1"
About LocTote Industrial Bag Co. Watching his stuff get stolen spurred Don Halpern to create anti-theft bags. 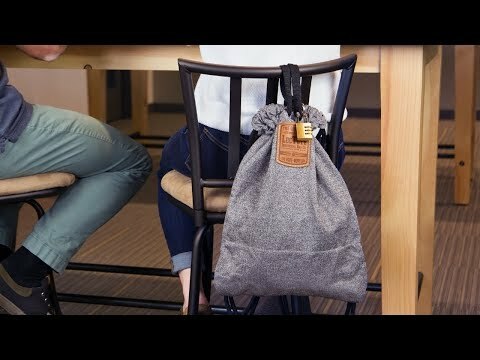 LocTote’s flexible drawstring backpacks are close to indestructible. They’re slash- and tear-proof, water-resistant, and virtually impossible to crack into when locked. The high-performance fabric they’re made out of is about five times more cut-resistant than Kevlar—it was originally developed for use in body armor. All the bags are secured with a 3-digit combination lock and a nylon locking strap with a 1,000 pound breaking strength. And the fleece-lined interior pocket is also RFID- and water-blocking, too. It’s a convenient, durable way to add some extra protection to whatever you’re toting.